All Photos courtesy New York Rangers via Twitter. It was a weekend to forget for the Blueshirts. First, they continued their road woes by being so uncompetitive in an all too predictable 5-2 loss at the House of Horrors up in Montreal. It truly was embarrassing. They were so bad that it took the Canadiens scoring the game’s first four goals before coach David Quinn used a timeout to gather his overwhelmed team together and let them know they are better than this. Initially, it worked. After basically handing the Habs a 4-0 lead with Brady Skjei the main culprit on three, they responded by getting the next two goals before the second period concluded. Jimmy Vesey scored his ninth and set up Ryan Strome on the power play to cut the deficit in half. Strome is continuing to impress since coming over from Edmonton for Ryan Spooner. He almost had a second consecutive goal on a great set up from slumping freshman Brett Howden. However, Strome blew the wide open chance with half the net to shoot at due to shanking it off the outside of the post. Had he converted, who knows what could’ve been. Instead, the Canadiens regrouped thanks to a boneheaded penalty by Skjei for delay of game. Of course, Montreal took advantage with rejuvenated forward Tomas Tatar rebounding home his 11th past a frustrated Alexandar Georgiev for a 5-2 lead. At one point in the second following a second consecutive Canadiens two-on-one from the same side, resulting in noted sniper Arturri Lehkonen making it 3-0 after a awful pinch by Skjei, the rookie goalie broke his goalstick against the cage. He learned from the best, Henrik Lundqvist. He expressed later that he felt he could’ve stopped it. None of the five Montreal goals were his fault. The Rangers were badly outplayed, getting outshot 41-22, including 31-17 through two periods. They were defensively inept. A bad trend that started in the hideous 4-0 shutout loss at the Flyers on Black Friday. They haven’t been working smart enough. In dropping their fifth game in the last six on Sunday night, by blowing a 3-0 lead in the third period to the explosive Winnipeg Jets 4-3 in a shootout, the effort has been disjointed. It’s leading to inconsistency and being totally dominated like last night when the Jets outshot them 42-19. It took Winnipeg a little longer to solve Lundqvist, who was remarkable on a special night the Rangers organization honored Vic Hadfield by retiring his Number 11 to the rafters. The gritty and tough physical left wing, who captained the team while doing the dirty work on the franchise’s best line, centered by Jean Ratelle and flanked by Rod Gilbert, was the first Ranger to reach 50 goals in a single season. Playing on the G-A-G (Goal-A-Game) Line, his best season came during ’71-72 when he achieved career bests with 50 goals and 56 assists for 106 points. That included 23 power play goals and another 27 at even strength. It also included 142 penalty minutes, seven game-winners and 44 of his 56 assists at even strength. That means he totaled 71 even strength points. A remarkable number. Hadfield was accompanied by his linemates, Gilbert and Ratelle along with The Cat, Emile Francis. The list of retired numbers included Mark Messier, Adam Graves, Ed Giacomin, Mike Richter, Brian Leetch, Gilbert and Ratelle. His beautiful family was on the ice for the bone chilling ceremony. As usual, it was very classy from the Rangers. Check out the look the prideful man, who scored 262 goals and tallied 310 assists for 572 points as a Blueshirt, had as he hugged his grandchildren. Hadfield meant so much to those teams that challenged for the Stanley Cup in the early 70’s. If only Ratelle had been fully healthy in 1972 when they lost to the powerful Bruins led by Bobby Orr and Phil Esposito. The Rangers lost the Stanley Cup Final in six games. My father was there when Orr skated the Cup. Crazy. He still harbors ill will towards Francis for breaking that team up. Hadfield was unceremoniously dumped to the Penguins following ’73-74 for Nick Beverley on May 27, 1974. Hadfield was still productive into his mid-30’s scoring 31 goals and 30 with Pittsburgh his final two full seasons. A knee injury against Toronto ended his career in 1976. After going 8-5-13 during the ’71 Playoffs, Hadfield put up seven goals and nine assists for 16 points in ’72. He certainly did his part. Gilbert had 15 points and Bobby Rousseau led the team with 17. Other notables included Bill Fairburn, ’71 overtime hero Pete Stemkowski, Brad Park, Walt Tkaczuk, Ted Irvine, Bruce MacGregor and Dale Rolfe. Ratelle came back from a broken ankle, but was ineffective versus Boston. He had one assist in six games. Ironically, the break came on a Rolfe shot that he tried to redirect in a game against the California Golden Seals in March of ’72. Me being intrigued by history including being a JFK conspiracy theorist, I find it ironic that Ratelle would break his ankle when he couldn’t be stopped. Gilbert suffered the same fate in ’68. At the time, Ratelle had tied Gilbert’s franchise record point streak at 13. I guess it was truly an unlucky number. The GAG Line still has a NHL record for most total points combined as a line. That’s because they stayed intact for six years until Hadfield was traded in ’74. The special ’72 season saw them total 312 points even with Ratelle’s injury that kept him out the first two rounds. So, how can I go back to assessing the Rangers blowing a three-goal lead in a brutal third? Well, I’ll be honest. I enjoyed writing about the history of the G-A-G Line. They were amazing. I wish I could’ve seen them play. That must’ve been truly special. Don’t forget Gilles Villemure was the other goalie behind Giacomin. They shared the Vezina in ’70-71. The Rangers scored three times on 11 shots against Connor Hellebuyck. He’s having a miserable year with over a 3.00 GAA and below a .900 save percentage. That continued on goals from Jesper Fast (first since Opening Night), Marc Staal and Chris Kreider (team best 14th on the power play). While the goals Fast and Kreider scored Hellebuyck had little chance on, he allowed Staal to beat him far side with a clear sighted shot. A term Steve Valiquette uses on MSG. It still was a pretty good shot by Staal, who drove it off the far post and in for his second in four games. He also assisted on Fast’s tally. Not bad for the veteran who had only one goal in 72 games last season. The problem was the Rangers got little attack time throughout. There was a huge discrepancy in territorial play. Even with a nice edge in faceoffs (39-23), it didn’t matter due to Winnipeg. They have TMT. Too much talent. Even without concussed defenseman Dustin Byfuglien, they came at the Rangers in waves. Boasting arguably the league’s best talent that features Mark Scheifele, Blake Wheeler, Patrik Laine and Kyle Connor, they are flat out scary. The amount of speed and skill they have is insane. Nikolaj Ehlers and Thrashers hold over Bryan Little are no slouches either. With an all out attack that allows defensemen such as underrated Josh Morrissey to activate, they can swarm you. Imagine what Lundqvist had to deal with. He was the only reason this was competitive. He robbed Connor twice in the second and denied other dangerous Jets several times. A god awful Brendan Smith penalty opened the door. It didn’t take long for Scheifele to finish a Wheeler pass right in the slot. Jack Roslovic took advantage of the Rangers defense which was preoccupied with other Jets players in front of Lundqvist. While that was going on, he cut to the middle away from Lias Andersson and fired a bullet for another Winnipeg goal. Two goals within 2:26 changed the whole complexion. Lundqvist continued to come up with miraculous saves to keep his team in front. The Rangers had a few solid shifts where they got the puck deep including one from veteran Matt Beleskey. A Hartford recall, the 30-year old played on the fourth line with Steven Fogarty and Vinni Lettieri. Tim Gettinger was sent down. That’s okay. Let him develop more. Beleskey can supply the role Cody McLeod filled. It’s interesting to note that they’re 1-4-1 since his injury. Just saying. 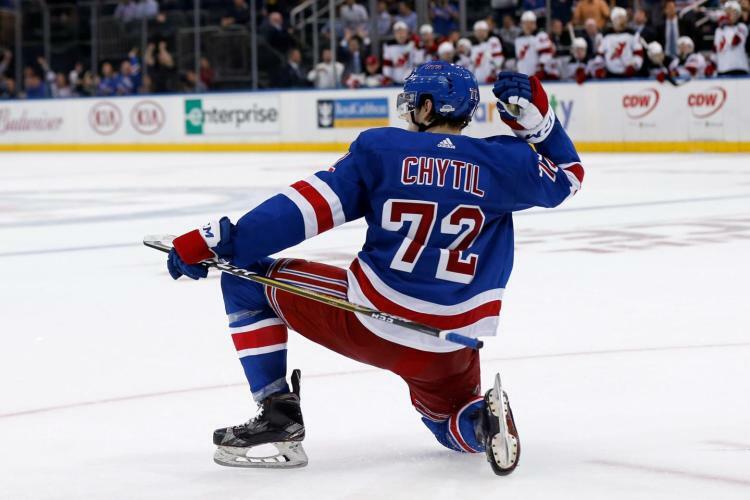 The best chance to regain a two-goal lead came from Filip Chytil. He made a good move out of the corner, but missed. There wasn’t much else going on offensively. I wondered if they could hang on. Would the Jets pull Hellebuyck for a six-on-five? It never even reached that point. Instead, like a flash, Ehlers breezed into the zone with Kevin Shattenkirk backing up. That spelled doom. Ehlers wisely aimed a low hard shot that Lundqvist couldn’t control. The rebound went right to Little, who buried it to tie the score with 2:30 remaining. There was nothing the Rangers could’ve done differently. They had numbers back. But the rebound went right by Fredrik Claesson before he could react. It was a set play. It could’ve been worse. They could’ve not gotten a point like the Capitals, who mystifyingly blew a five-goal lead on home ice in a crushing 6-5 loss to the Ducks. The three-on-three was a joke. If you thought what Scheifele and Company did to the Devils was bad, you should’ve seen what this overtime looked like. A total mismatch. Winnipeg had eight shots on Lundqvist, who basically stood on his head robbing Connor and Laine just to take it to a shootout. Mika Zibanejad (2 assists) scored on his patented forehand deke snapshot on Hellebuyck in Round Two. But Laine went high bar and then Jimmy Vesey missed. That left it up to Scheifele, who finished it by going low underneath the glove of a dejected Lundqvist, who reacted negatively to a silly question from true pro John Giannone. I know Giannone has a tough job, made harder by the production truck. But that was totally a bad time for such an awkward question. He had a look of death on his face. Think Adam Sandler in my favorite movie of his, The Wedding Singer. I got nothing else to add. This entry was posted in Battle News and tagged 1972, Adam Graves, Alexandar Georgiev, Bobby Orr, Bobby Rousseau, Brad Park, Brady Skjei, Brendan Smith, Brian Leetch, Bruins, Bryan Little, Canadiens, Chris Kreider, Column, Connor Hellebuyck, Ed Giacomin, Emile Francis, GAG Line, Henrik Lundqvist, Jack Roslovic, Jean Ratelle, jersey Retirement, Jesper Fast, Marc Staal, Mark Messier, Mark Scheifele, Matt Beleskey, Mika Zibanejad, Mike Richter, Number 11, Patrik Laine, Pete Stemkowski, Rangers, Rod Gilbert, Ryan Strome, Stanley Cup Final, Vic Hadfield, Winnipeg Jets. Bookmark the permalink.